Sweet up your carnival! 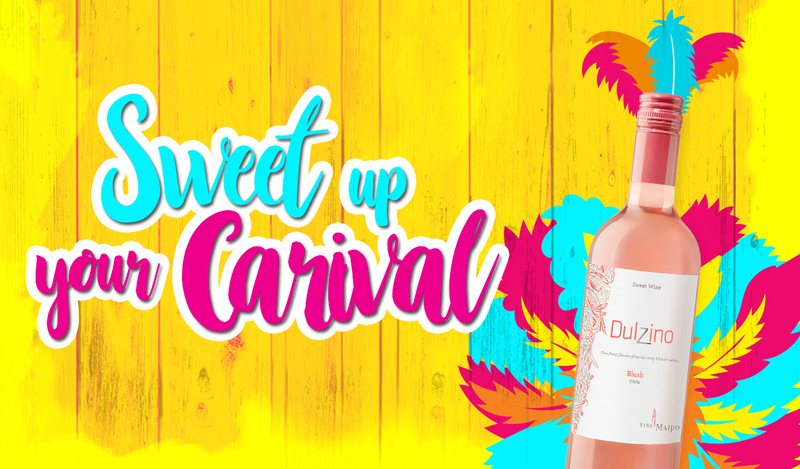 With each bottle of fresh, fruity DulZino wine you purchase at participating locations, you’ll have a chance to enter a raffle for fantastic prizes! The first prize winner will get 1 branded jug, 2 branded folding chairs, 6 branded glasses, 10 T-shirts and a case of DulZino win. The second prize winner will receive one case of DulZino wine. All you have to do to enter is is clearly write your name and phone number on the back of your receipt from your wine purchase and then drop it in the ballot box at participating locations! This campaign begins on February 1 2019 and ends on February 26 2019. Winners will be drawn and announced on February 27 2019. You will receive a phone call if you are a winner! About Viña Maipo DulZino Wines: One of the five main wine exporting companies of Chile, Viña Maipo was founded in 1948 in the Maipo Valley, a world-renowned region for producing wines of outstanding quality. Two decades later, Concha y Toro, the largest Chilean wine group, acquired the winery, enhancing the quality of its wines and laying the foundations for its global spirit. With a presence in more than 80 markets, Viña Maipo has demonstrated the potential of Chile for the production of great wines, born from a long tradition of winemaking and a genuine passion for authenticity. The DulZino product line features fresh, fruity wines that have become a hit among younger consumers around the world. About Aruba Trading Company: A wholesaling company with a history that goes back six generations to sailor Eliau Moses Curiel and his son Morris. There have been many Curiel companies and stores since the 1800s, and Aruba Trading Company is currently focused on providing superior products and service with its wide variety of champagnes, wines, spirits, beers and other beverages.